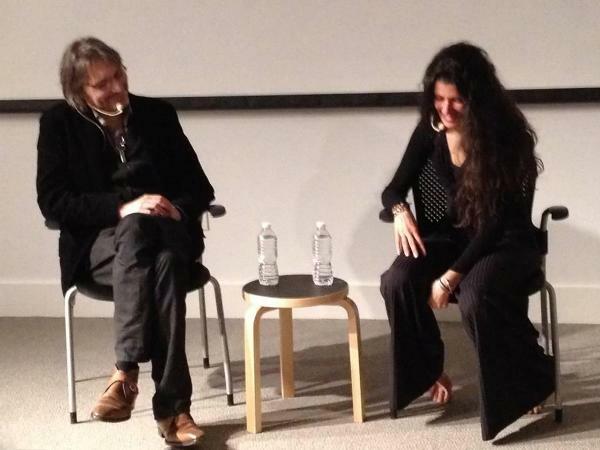 After giving a brief overview of her work last Wednesday evening as part of the ongoing series Conversations with Artists, Janine Antoni calmly stepped away from her podium, took off her shoes, and walked to the center of the floor. Slowly she began to sway, moving her arms limply from side to side, gingerly tilting her head back, and lifting her feet. But she also continued to address everyone in the room, orally and physically guiding us through her movements of the dance, the 5Rhythms. “Our feet are on the same ground,” she told us, “you’re moving with me.” And as I leaned in closer, I noticed everyone around me was too. Up until this point, I had only encountered Antoni’s work through research. I knew about her various pieces: rubbing one rock against another for a span of days in And (1996-99), tightrope walking over the ocean in Touch (2002), harnessing herself to a dollhouse replica of her home in Inhabit (2009)—and I understood that in all this, the artist was seeking connection between herself and other people. But I never felt connected. These works seemed too narrowly based in personal relationships of motherhood, womanhood, and love to include me. The nature of their subject matters and their intimacy seemed to belong exclusively to the artist. 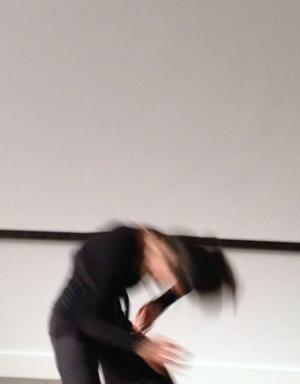 But in sharing Antoni’s experience of dancing the 5Rhythms with both her and the audience, I began to feel connected. Immediately, I harkened back to Antoni’s dance . . . “you’re moving with me,” she had said. Before this Conversation, I saw Antoni’s work as a private and personal journey into the bodies, thoughts, and feelings of others. I didn’t understand the role of the audience, the part I could play in Antoni’s work. I didn’t understand that my role was necessary to her art’s meaning. But when I felt Antoni’s feet pounding the floor, and when I heard her voice calling out to the audience, and me, I felt connected . . . I was moving with her. Suddenly, I didn’t feel alone that evening, and I don’t think Antoni did either. I’ve found that Janine Antoni and every participant in the Conversations with Artists series has enhanced my understanding of their art, not only as ideas that must be talked about, but also as entities that must be experienced. To explore this season’s theme–Art as Experience–we began with Wolfgang Laib in October and continued with The Otolith Group, Jill Downen, Anthony McCall, and, of course, Janine Antoni. Tonight, the experience draws to a close at the season’s final Conversation with William Pope. L. It will be another packed program, but standing room may become available for those willing to come a bit early and wait in line. Hope to see you there! When the possibility of creating a work inspired by Snapshot: Painters and Photography, Bonnard to Vuillard arose several months ago, I was immediately struck by the notion of how a new technology (the camera) could reshape the vision of an artist. To me, this parallels the evolution we are currently experiencing in the performing arts world, as technological developments reshape how artists create, and subsequently how audiences consume, live performance. When I had the pleasure of seeing the Snapshot exhibition several months later, the rich pool of imagery in it overwhelmed me. I found a strong sense of intimacy, an almost voyeuristic feeling that the photographs I was looking at were not intended for public viewing. Snapshot Confidential is the direct result of how that imagery washed over me and left impressions in my mind, which then led to the generation of movement. I was also very motivated by a statement I read, detailing how the advent of the camera pushed artists to reevaluate the lighting, framing, and perspective of their artwork. I felt compelled to explore this imagery, intimacy, framing of perspective, and lighting through dance. I invite you to join us on March 15 at 6:30 pm, and let these dances wash over you as the paintings and photographs of the exhibition washed over me. Get a sneak peek at Snapshot Confidential: Dancers and Photography with these photos from the rehearsal. Choreographer and artist-in-residence at CityDance Christopher K. Morgan provides insight on the dancers, lighting, and props in the captions below. See Snapshot Confidential this Thursday, March 15 at 6:30 pm. 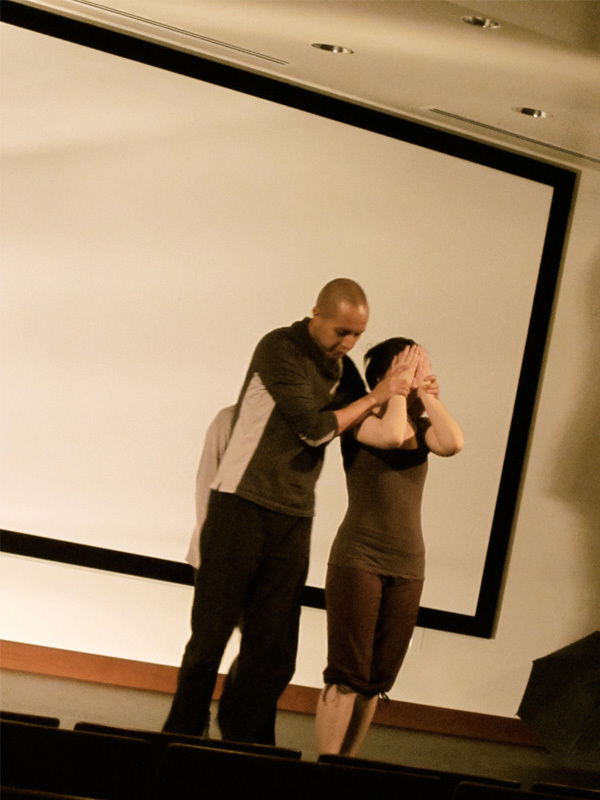 Artistic Director Christopher K. Morgan works with dancer Meghan Pilling in rehearsal for Snapshot Confidential in the auditorium at the Phillips Collection. 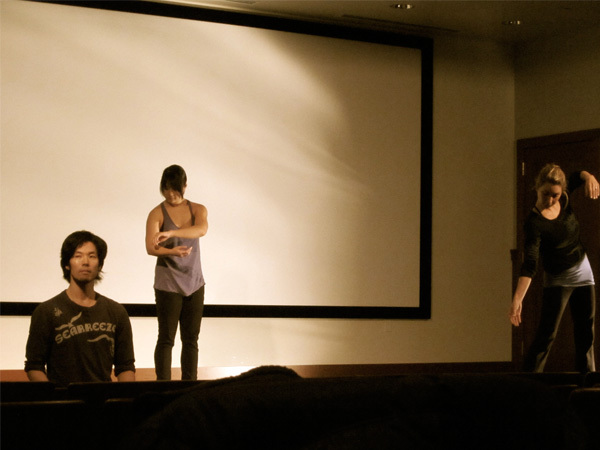 Dancers Junichi Fukuda, Tiffanie "Fi" Carson, and Shannon Braine, in rehearsal of the opening section of Snapshot Confidential. (Left) Dancer Tiffanie "Fi" Carson works with light and photographs for a section of Snapshot Confidential. 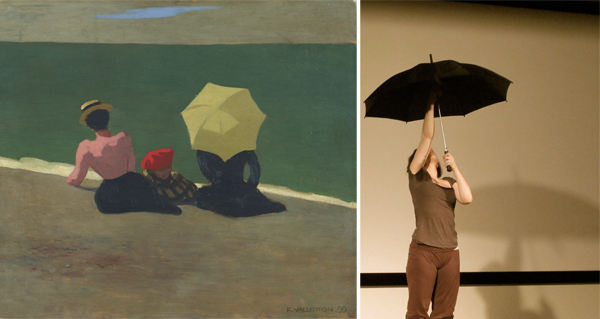 Inspired by how the painters featured in the exhibit began to experiment with framing and lighting their subjects in photographs, Morgan's dance will explore the use of light and shadow. (Right) Dancer Meghan Pilling in rehearsal for Snapshot Confidential. The visual imagery in the exhibit inspired the use of props for the dances. 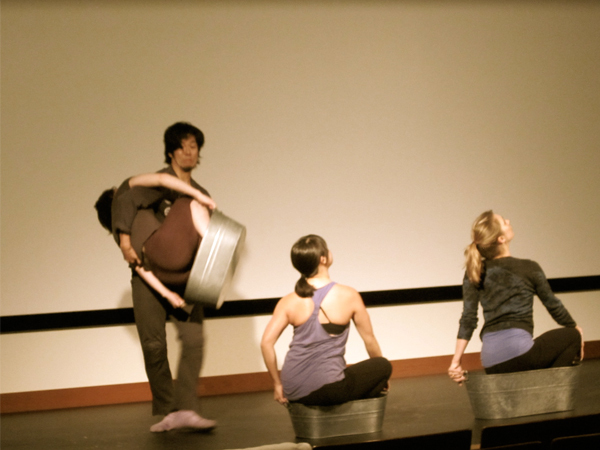 Dancers Junichi Fukuda, Meghan Pilling, Tiffanie "Fi" Carson, and Shannon Braine, in rehearsal for Snapshot Confidential.